Claraite: Mineral information, data and localities. Formerly thought to be (Cu,Zn)3(CO3)(OH)4·4H2O. For the type locality, the Clara mine. First reported by Walenta (1975) as "unnamed copper carbonate" and subsequently approved with the formula (Cu,Zn)3CO3(OH)4.4H2O (Walenta, 1982). Several later studies showed, however, that claraite contains minor, but essential As and S (U. Kolitsch, 2007-2015, unpublished data; Putz, 2011; Kolitsch, 2012; Putz et al., 2012). Claraite was finally redefined, with the help of a crystal-structure determination, as (Cu,Zn)15(AsO4)2(CO3)4(SO4)(OH)14·7H2O (Biagioni & Orlandi, 2017). 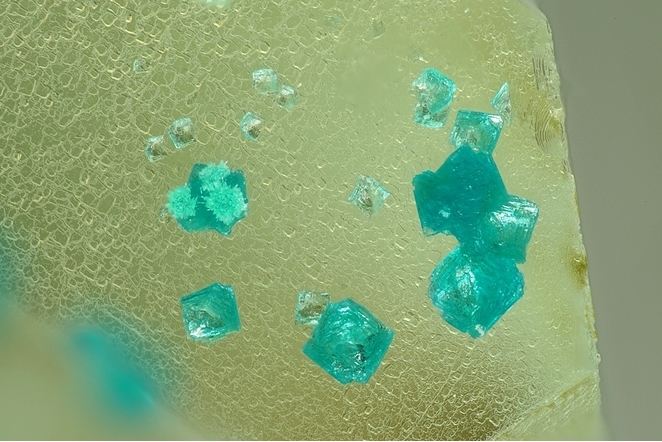 This makes claraite a species with unique element combination: it is currently the only known arsenate-sulfate-carbonate mineral. 2016: Proposal IMA 16-L, redefined as a copper hydrated hydroxy-carbonate-arsenate-sulfate mineral having ideal chemical composition (Cu,Zn)15(CO3)4(AsO4)2(SO4)(OH)14·7H2O. Redefinition and crystal structure published by Biagioni & Orlandi (2017). University of Stuttgart, Stuttgart, Germany. National Museum of Natural History (Smithsonian), Washington, D.C., USA, 148464. Walenta, K. (1982) Clarait, ein neues Karbonatmineral aus der Grube Clara (mittlerer Schwarzwald). Chemie der Erde: 41: 97-102. Azurite 33 photos of Claraite associated with Azurite on mindat.org. Theisite 22 photos of Claraite associated with Theisite on mindat.org. Malachite 16 photos of Claraite associated with Malachite on mindat.org. Strashimirite 8 photos of Claraite associated with Strashimirite on mindat.org. Tyrolite 6 photos of Claraite associated with Tyrolite on mindat.org. Fluorite 4 photos of Claraite associated with Fluorite on mindat.org. Chalcopyrite 4 photos of Claraite associated with Chalcopyrite on mindat.org. Zálesíite 3 photos of Claraite associated with Zálesíite on mindat.org. Siderite 2 photos of Claraite associated with Siderite on mindat.org. Quartz 2 photos of Claraite associated with Quartz on mindat.org. 5.DA.05 Dypingite Mg5(CO3)4(OH)2 · 5H2O Mon. 5.DA.05 Hydromagnesite Mg5(CO3)4(OH)2 · 4H2O Mon. 5.DA.05 Widgiemoolthalite Ni5(CO3)4(OH)2 · 5H2O Mon. 5.DA.05 UM1987-01-CO:HMgS Mg4(CO3)2(OH)4 · 6H2O ? Mon. 5.DA.10 Artinite Mg2(CO3)(OH)2 · 3H2O Mon. 5.DA.15 Otwayite Ni2(CO3)(OH)2 · H2O Orth. 5.DA.15 Zaratite Ni3(CO3)(OH)4 · 4H2O ? Iso. 5.DA.20 Kambaldaite NaNi4(CO3)3(OH)3 · 3H2O Hex. 5.DA.25 Callaghanite Cu2Mg2(CO3)(OH)6 · 2H2O Mon. 5.DA.35 Hydroscarbroite Al14(CO3)3(OH)36 · nH2O Tric. 5.DA.35 Scarbroite Al5(CO3)(OH)13 · 5H2O Hex. 5.DA.40 Caresite Fe2+4Al2(OH)12[CO3] · 3H2O Trig. 5.DA.45 Brugnatellite Mg6Fe3+(CO3)(OH)13 · 4H2O Hex. 5.DA.45 Zaccagnaite Zn4Al2(OH)12[CO3] · 3H2O Hex. 5.DA.50 Comblainite Ni4Co2(OH)12[CO3] · 3H2O Trig. 5.DA.50 Reevesite Ni6Fe3+2(OH)16(CO3) · 4H2O Trig. 5.DA.50 Takovite Ni6Al2(OH)16[CO3] · 4H2O Trig. 5.DA.50 UM1998-10-CO:CoHNi Co6Fe2(CO3)(OH)16 · 4H2O ? 5.DA.55 Coalingite Mg10Fe3+2(OH)24[CO3] · 2H2O Trig. Dunn, P.J., Fleischer, M., Burns, R.G., Pabst, A. (1983) New mineral names. American Mineralogist: 68: 471-475. Walenta, K. (1999) Zu den Gitterkonstanten von Clarait [On the lattice constants of claraite]. Der Erzgräber: 13: 20-22 (in German). Jambor, J.L., Roberts, A.C. (2003) New mineral names. American Mineralogist: 88: 251-255. Walenta, K. (1999) Zu den Gitterkonstanten von Clarait. Der Erzgräber: 13: 20-22. Kolitsch, U., Brandstätter, F. (2012) 1743) Baryt, Chalkophyllit und Clarait vom Pengelstein bei Kitzbühel, Tirol. P. 149. in Niedermayr, G. et al. 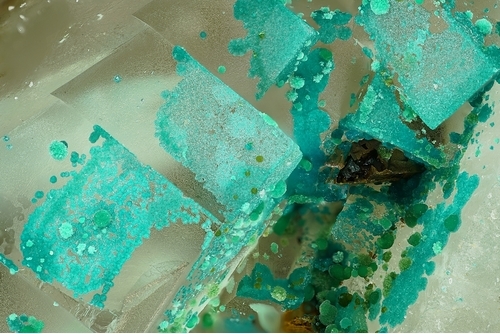 (2012): Neue Mineralfunde aus Österreich LX. Carinthia II, 202./122., 123-180 (in German). Biagioni, C. & Orlandi, P. (2017): Claraite, (Cu,Zn)15(AsO4)2(CO3)4(SO4)(OH)14·7H2O: redefinition and crystal structure. European Journal of Mineralogy 29, 1031-1044. The following Claraite specimens are currently listed for sale on minfind.com. Putz, H. (2011): Neuigkeiten zur Landesmineralogie von Salzburg. Miner. Arch. Salzb., 14, 304-308 (p. 305-306: Clarait aus dem Danielstollen, Leogang). Poeverlein, R. (2008): Euchroit und seine Begleiter vom prähistorischen Bergbau, Leogang, Österreich. Lapis, 33 (5), 13-22. Schnorrer, G. and Poeverlein, R. (2002) Schwaz-Brixlegg-Fundstellen: 2. Die Minerale des Stockerstollens bei Brixlegg in Tirol. Aufschluss, 53, 209-228. Schnorrer, G. & Poeverlein, R. (2010): Schwaz-Brixlegger Fundstellen: 7. Die Minerale des Bergbaus Hofer Tratte bei Brixlegg in Tirol. Aufschluss 61, 147-156. 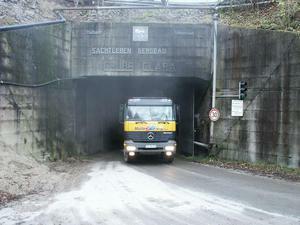 Schnorrer, G. & Poeverlein, R. (2005): Schwaz-Brixlegger-Fundstellen: 3. Die Minerale vom Bergbau Maukenötz bei Brixlegg, Tirol. Der Aufschluss, 56, 223-234. Putz, H. & Poeverlein, R. (2007): Die Mineralien des Gertraudstollens und seiner Halde in St. Gertraudi, Tirol. Lapis 32 (6), 58-63. Kolitsch, U. & Brandstätter, F. (2012): 1743) Baryt, Chalkophyllit und Clarait vom Pengelstein bei Kitzbühel, Tirol. P. 149. in Niedermayr, G. et al. 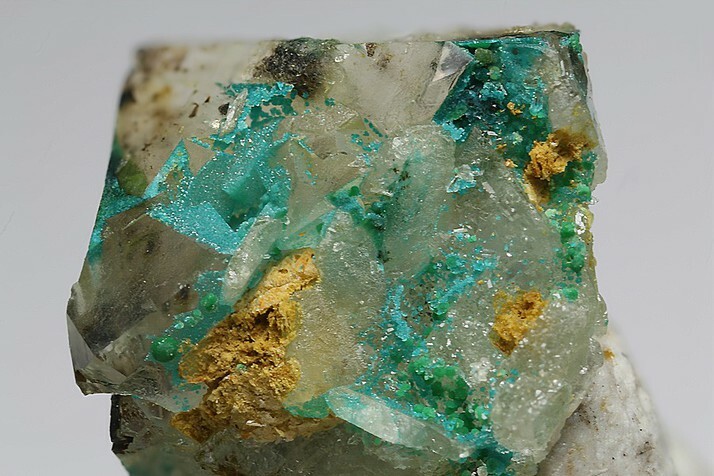 (2012): Neue Mineralfunde aus Österreich LXI. Carinthia II, 202./122., 123-180. Deliens, M., Berbain, C. & Favreau, G. (1993): Les Anciennes mines de Padern-Montgaillard (Aude). Géologie, Histoire et Minéralogie. Association Française de Microminéralogie, 84 pp. Blaß, G. & Graf, H. W. (1995): Neufunde von Schlackenhalden in der nördlichen Eifel (II). Mineralien-Welt, 6 (3), 28-31. Bender, D. and Krimmelbein, W. (1994) Aktuelle Übersicht: Mineralien der Zinkhütte Genna/Sauerland. Stand Juni 1994. Mineralien-Welt, 4/94, 10. Sánoor Szakáll, Mária Foldvári, Gábor Papp, Péter Kovács-pálffy, Árpád Kovács (1997) Secondary Sulphate Minerals From Hungary. Acta Mineralogica-petrographica, Szeged, Xxxviii, Supplementum, 7-63. Bortolozzi, G.M., Bracco, R., De Tuoni, F., Vidus, L., Bittarello, E., Marengo, A., Ciriotti, M.E., Zorzi, F. (2018) Antiche miniere e affioramenti metalliferi a Comeglians (Val Degano, Friuli-Venezia Giulia): recenti ritrovamenti. Micro, 16, 1-2018, 2-36.
ⓘ Monte Avanza Mine ? Bortolozzi G,M., Ciriotti M.E., Bittarello E. and Moeckel S. (2015): Monte Avanza, Forni Avoltri; Carnia (Udine, Friuli-Venezia Giulia): conferme e nuovi ritrovamenti. Micro,1-2015, 2-39. Orlandi, P. & Criscuolo, A. (2009). Minerali del marmo delle Alpi Apuane. Pacini editore, Pisa, 180 pp. Garrido, J.L., Rosell, J., Viñals, J., Bártulos, V., Mingueza, P., Ortiz, X and Vinyoles, J. (2013): "Mineralogy of Les Ferreres mine, Rocabruna, Camprodon, Catalonia". Mineral Up, Vol.3, Nr.4, 6-23. Rosell, J., Garrido, J.L., Viñals, J., Bártulos, V., Vinyoles, J., Ortiz, X., Mingueza, P., Masons, G., Bobi, F. (2014): Rocabruna i el seu entorn. La mina de les Ferreres. Edited by the authors and Grup Mineralògic Català. 128 pages (with the mineralogy chapters in Spanish and English). Cuchet, S., Ansermet, S. & Meisser, N. (2012): Die kupferhaltige Mineralisierung am Six Blanc im Wallis. Schweizer Strahler 46 (4), 2-16 (in German and French). Stalder, H. A., Wagner, A., Graeser, S. and Stuker, P. (1998): Mineralienlexikon der Schweiz. Wepf (Basel), p. 115.